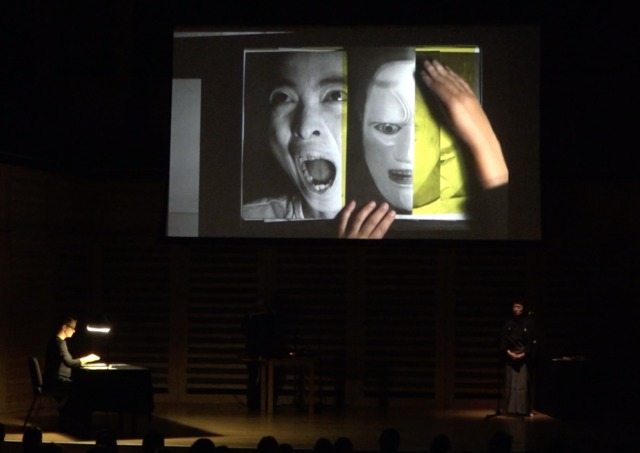 Echoes and Callings performed at The Transformative Power of Noh as part of Noh Reimagined festival. 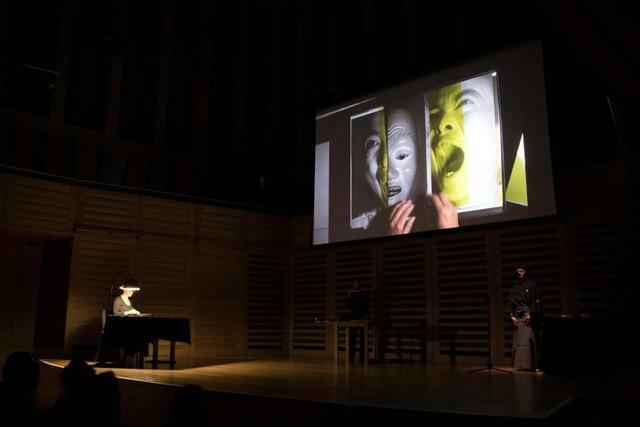 Wiebke Leister’s and David Toop’s collaboration ‘Echoes and Afterlives’ for the last Noh Reimagined festival at Kings Place in May 2016 explored the significance of voice and face masking through the moment when a mask meets a face. 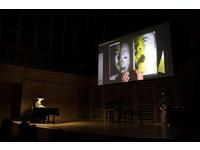 Their new piece ‘Echoes and Callings’ combines live collage and sound improvisation to evoke the out-of-body existence of female demons. In 'Echoes and Callings' we will be meeting Hannya. Or Namanari. Or possibly Hashi-Hime. Angry spirits that emerge from Japanese Noh drama and storytelling. She will be met in different figurations and materialities, but we will encounter her through her transformative states as woman who has become a demon – through pain or betrayal. Her images themselves now returning ghosts, apparitions and echoes, seeking both revenge and release. 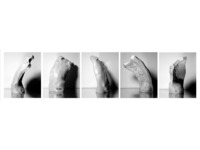 Re-embodied, contradictory and intertextual, we will be following her imaginary genealogy in word and image. Telling tales of silence and manifestation, pain and embodiment, stillness and fury - from abstraction to figuration. 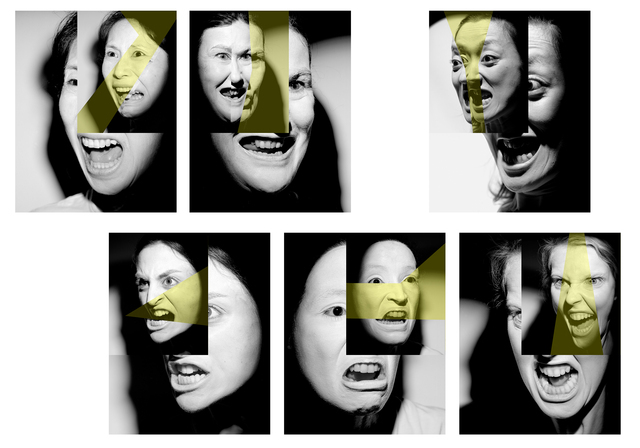 Body in pieces, mouth half-open, part shouting, part screaming; troubled and maltreated, while setting out to frighten. Conjuring up her liminal existence as she reveals herself as a terrifying image that is being upheld. In this way, she has existed throughout times and cultures. But today, more than ever, recognized as released and untamed, and finally, speaking out, loud. David Toop is a musician, composer, writer and sound curator. He has written seven books, including Ocean of Sound, Sinister Resonance and Into the Maelstrom. As an improviser he has recently collaborated with Rie Nakajima, Sidsel Endresen, Thurston Moore, Tania Chen, Miya Masaoka and Ryuichi Sakamoto. 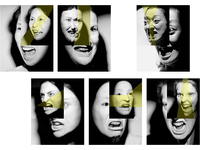 Wiebke Leister is an artist and researcher. Her works challenge the limitations of photographic representation, often focusing on the human face as a canvas, a medium or an agent. 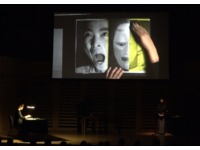 This April she travelled in Japan to visit Noh masters and study visualisations of female demons. Her exhibition ‘Echoes and Callings’ is at White Conduit Projects in London until 29 July 2018.